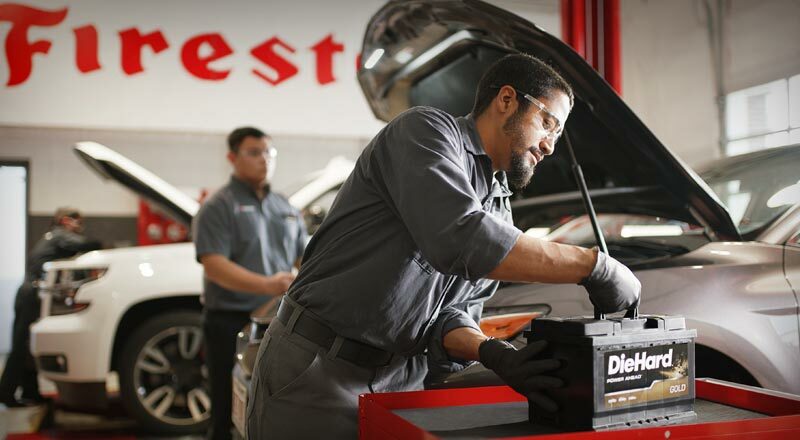 Buy car batteries in West Saint Paul at a Firestone Complete Auto Care near you. Make an appointment online to have your current car battery tested or get a new Interstate battery installed today! Don't wait until the dreaded "click" to get a new car or truck battery! Without a healthy car battery, your vehicle is almost as good as dead. In West Saint Paul, Firestone Complete Auto Care is the best shop for battery replacement, service, and testing. If you're wondering about an engine that's hard to start or new check engine light, it's time to give your battery some TLC. Corrosion around the terminals, low fluid, and a bloated case are also indicators of a battery that isn't as strong as it needs to be. Talk to our technicians about the best battery for your car today—before you hear the dreaded "click!" Stop by Firestone Complete Auto Care for a free battery check in West Saint Paul. We can tell you how much longer your battery will live, along with the temperature it could quite. Our technicians can help you choose the best car battery for your budget, climate, and vehicle type. We install over 2,000 batteries every day using the most popular replacement battery in America, Interstate Batteries. They've been the industry leader in reliability and performance since 1965, and that's time tested technology and experience we trust. From test to installation, we'll help ensure your vehicle runs strong, whatever the season. There's more to a healthy car than meets the eye. Your automotive battery may get the engine revved and ready to go, but other parts play big roles too. There's your brakes, steering and suspension, engine, tires, alignment, filters, and more! Firestone Complete Auto Care in West Saint Paul is the place to go for all of it. You'll get the best total car care we offer, from the moment you drive into our parking lot! So whether you need an initial battery test, you're shopping for Bridgestone tires, or you need fast flat tire repair, make an appointment online and point your dash towards Firestone Complete Auto Care. Highly skilled technicians are prepared to give your vehicle the service it needs. From drivetrain services to steering and suspension to tire repair, turn to your local Firestone Complete Auto Care for your car or truck maintenance and repairs. We're your go-to tire store, service center, and repair shop. Our automotive technicians work hard to help keep your vehicle performing its best. Bring your truck or car to us for maintenance and we will strive to make your visit satisfying. Experience the difference and book an appointment online for auto service in West Saint Paul, Minnesota today.